Balancing wine holder in Rustic style. Dimensions: 30 * 5.5 * 3 cm. Made of high-quality wood (pine), polished smoothly and covered with stains that provides a stand unique stylish look. Easy to use portable holder for 750 ml. bottles. You can use a not not only for wine but also for your other favorite drinks. Surprise your friends and guests at the festive table by placing the bottle in such a conquering gravity (Gravity defying) stand. Stylish decor for your interior! Stand made in beloved by all Rustic style because of its simplicity and brevity and natural wood. It will look beautiful in the living room, kitchen and terrace. Will add a highlight and sophistication to your home, perfectly harmonizes with different styles. The perfect gift for all wine lovers! Are you going to visit someone with a bottle of wine? Take this wine holder as a gift and you will remain the best and most beloved friend who understands what a true friendship is! GRAVITY DEFYING wine bottle holder in Rustic style. Dimensions: length - 11,8"\30cm, width - 2,2"\5,5cm, thickness - 1,2"\3 cm HIGH QUALITY MATERIAL. Made of high-quality wood - pine, polished smoothly and colored with a special wood stain that provides a stand with unique stylish look. EASY TO USE. You can use this portable holder not only for wine bottles, but also for your other favorite drinks. Just insert the bottle neck into the hole and slide it in and out to the balance point. This outstanding wooden holder can even hold half empty bottles! UNIQUE AND FASCINATING. 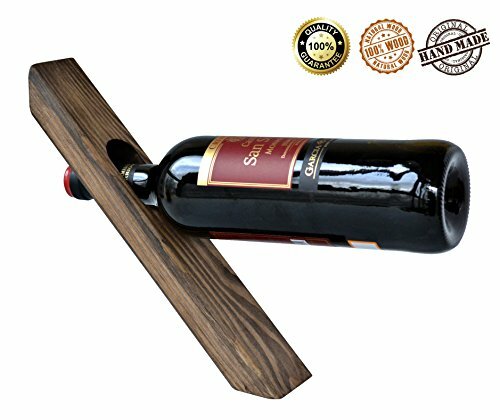 The rack uses the weight of wine bottle to balance itself - so it looks like it's floating in the air. Surprise your friends and guests at the festive table by placing the bottle in such eye-catching Gravity defying stand! STYILISH HOME DÉCOR. Something special for your interior! This stand is made in trendy Rustic style. Because of its simplicity, brevity and natural pattern of wood it will look beautiful and stylish everywhere - in the living room, kitchen, terrace. Perfectly harmonizes with different styles. Add a highlight and sophistication to your home. PERFECT GIFT for all wine lovers on any occasion! Birthday, Christmas, Thanksgiving, Housewarming Gift, for Him and for Her.